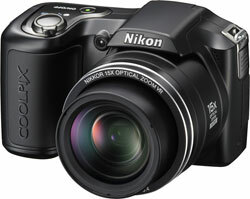 Nikon has announced new firmware for their compact camera Nikon Coolpix L100. The new firmware lets you use NiMH rechargeable batteries in the Nikon Coolpix L100 digital camera. The firmware will be available at the same time as Nikon releases new rechargeable batteries and a charger. The firmware will be released later this summer. June 9, 2009 – TOKYO – Nikon Corporation is pleased to announce the release of a genuine Nikon set of four nickel-metal hydride (NiMH) rechargeable batteries, Rechargeable Ni-MH Batteries EN-MH2-B4, and a retail set that includes the Battery Charger MH-73, for charging sets of four nickel-metal hydride rechargeable batteries, and one set of four Rechargeable Ni-MH Batteries EN-MH2-B4.